Professor Geraint Lewis undertakes a broad spectrum of research. On the largest scales, his program involves looking at the influence of dark energy and dark matter on the evolution and ultimate fate of the Universe. 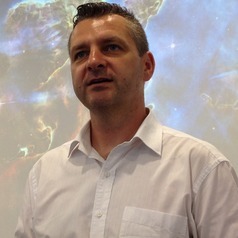 Closer to home, Geraint's research focuses upon Galactic cannibalism, where small dwarf galaxies are torn apart by the much more massive Milky Way and Andromeda Galaxy. Using telescopes from around the world, including the 10-m Keck telescope in Hawaii, he has mapped the tell-tale signs of tidal disruption and destruction, providing important clues to how large galaxies have grown over time.